Curated by Super Punch blogman John Struan! Artwork by an international group of super punchy artists: Aaron Miller; Adam Koford; Bethalynne Bajema; Brent Engstrom; Brent Nolasco; Brigid Ashwood; Britt Wilson; Casey Weldon; Cormac McEvoy; Dan Goodsell; Dave Perillo; Dean Reeves; E.G. 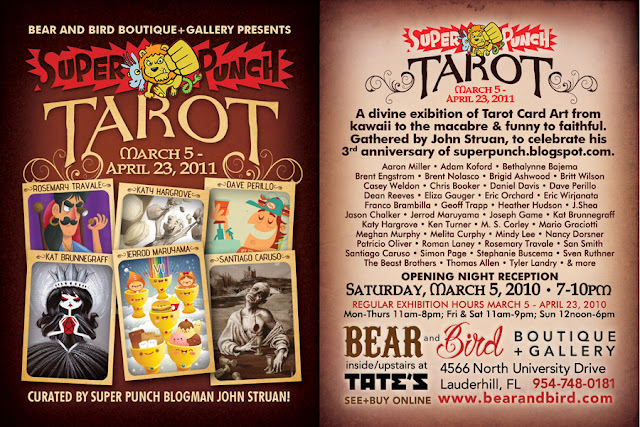 Gauger; Eric Wirjanata; Franco Brambilla; Geoffrey Trapp; Geoffrey Trapp; Heather Hudson; J. Shea; Jason Chalker; Jerrod Maruyama; Jerrod Maruyama; Joe Alterio; Justin Van Genderen; Kat Brunnegraff; Ken Turner; M.S. Corley; Mario Graciotti; Meghan Murphy; Melita Curphy; Mindy Lee; Nancy Dorsner; Roman Laney; Rosemary Travale; San Smith; Santiago Matias Caruso; Squink! ; Steam Crow; Stephanie Buscema; Sven Ruthner; The Beast Brothers and MORE! "For the third anniversary of my pop art website Super Punch, I invited my favorite artists to create a work of art. Asking them to create Tarot cards seemed like a a good way to unify the creations, while allowing the artists' disparate styles to shine. The resulting artwork includes sculptures, paintings, and digital work, and ranges from the kawaii to the macabre, and funny to faithful. Please, enjoy the show."